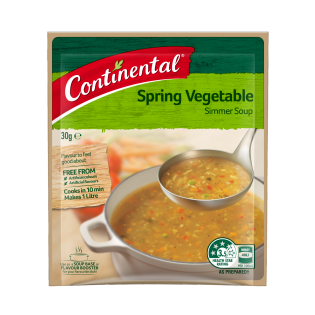 Try Continental Spring Vegetable Simmer Soup for a tasty snack and meal, or try one of our great recipes with it! When cooked: vegetables (74%) (contain sulphites) (carrot, onion, green bean, cabbage, celery, green pea, red capsicum), potato starch, salt, food acid (sodium citrate), maltodextrin, flavours, flavour enhancers (621, 635), sunflower oil, yeast extract, colour (turmeric), spice extract, herb extract. Allergens:Contains sulphites. Made on equipment that processes products containing wheat, milk, soybean, peanut, egg, sesame, fish and crustacea. simply... Stove top: 1. Empty Soup Mix into a saucepan with 4 cups (1 litre) cold water and mix well. 2. Stir until boiling and simmer for 5 minutes, stirring occassionally.